We had some high, high wind and rain about three weeks ago. I was sitting in my living room with Ralph, my beagle, and we heard the drip, drip, drip of water. Ralph went to the fireplace, I went looking up at the ceiling. I turned on all the ceiling lights to see where the leak was located. Could not see anything. Ralph kept looking at the fireplace. So, I followed Ralph to the fireplace. Sure enough, there was water leaking down into the fireplace. 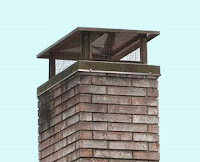 I thought, how is that possible with the chimney cap? After the rain let up, somewhat, I went outside and noticed the chimney cap had been swept away. Could not locate it anywhere in the yard. That must have been some mighty powerful wind. As I stated yesterday, my practically new Golds Gym treadmill is still dead. A treadmill tech is supposed to come out here by the end of the week. At least, that is what I was told. No call, no nothing since I paid (in advance, mind you) for the repair of my now very costly treadmill. I know this is of little consolation to those up north. But, down south, we have been experiencing one of the worst winters we have had in many years. Yes, we have had highs of 50 degrees. But, that is unusual for us on the gulf coast. That bitter spell in January is still very much the topic of conversation down here. Must be all that global warming Professor AlGore has warned us about. Finally, I have started using a new web browser. I had been using Firefox and a Firefox clone, Flock, for many years. I have gotten tired of the heavy use of resources that both those browsers utilize. I am now using Opera and could not be more please. Opera is what Firefox used to be; fast loading, and a not a load on memory or computer resources. I highly recommend it. Good luck with the treadmill. I got my wife a new one for Christmas because she said she'd like to get fit for the summer and doesn't have time to go to the gym. I think I've been on it more than she has.